A couple of years ago, The Department of Justice made changes to the Americans With Disabilities Act requiring all mobile apps to adhere to people with disabilities. This was a just change considering 56 million disabled people live in the United States who depend on apps every day. Beforehand, far too many mobile apps hadn't been created in a way that made them easy for disabled individuals to use. 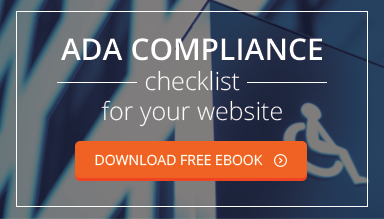 With that in mind, are your mobile apps ADA compliant? If not, you could face fines if you don't align your design with current requirements. Now that the ADA requires apps to have interactivity in a manner that's easy to navigate, you may need to refocus your design efforts. Any strategy you choose may have to come down to how you structure your app. The federal government has two different standards for accessibility, namely ADA Section 508, and WCAG 2.0 guidelines. When you use web technologies to build your app, you'll fall in line with the ADA requirements. However, you may align with the WCAG (Web Content Accessibility Guidelines) if your app gets built with native smartphone components. Since most successful apps use multimedia, you have to think about how disabled users properly view and hear needed elements. You may use specialized audio in your app that those with hearing difficulties need to properly interpret. It's why you'll need a textual transcript on your app to stay ADA compliant. Synchronization with the script is also important to avoid caption confusion. Some functions of your app may require quick actions based on audio commands, and non-synchronized captioning could cause serious mistakes. Color blindness might sound like a minor problem in relation to creating an app, but consider 8% of all men in the world (and 0.5% of all women) have this condition. Most of this consists of red-green color blindness, which could affect how people read colors on your app. If your app relies too much on red and green colors to convey information, you'll have to provide alternative ways to indicate what colors they are. In most cases, just stating what the color is can help, though consider using other primary colors for vital data. Those with specific disabilities might not have full capability to understand error messages in an app, including from color use mentioned above. It's usually recommended that you do not use red or green for error messages to avoid people misreading a message. Overall, though, you need to have full support from the assisted technology you're using. Making error messages clear in the platform you're using for iOS or Android can reduce any further confusion. You risk losing customers with disabilities when they get the impression your app is useless, just like anyone else would if you don't make the user interface simplified. Both iOS and Android platforms offer accessibility features like text-to-speech, plus haptic and gesture technologies. All of these are still evolving as well, with gesture concepts slowly becoming more mainstream. Considering these features needs analysis in your company now if you've put it off. It's recommended you evaluate all of your mobile apps (and regular website) features so you don't end up with regulatory fines. You can do this by having a recurring dialogue with your developers or third-party design team and coming up with action plans. Violation fines often become steep for statutory penalties. Regardless, you may receive a complaint from the Department of Justice or a letter from an ADA advocacy law firm first before being asked to make necessary app changes.